Today's card is for the High Hopes challenge with the theme "Zigs and Zags". Odie dog is from the new High Hopes spring collection. I coloured him with Copic Sketch markers. I did the background paper myself. I generated the text on the computer and print it on white banana paper, which has a lovely structure and gives a nice effect if you tear it. Meine heutige Karte ist für die High Hopes challenge mit dem Thema "Zick Zack". I also used a Copic blender pen, which doesn't show on the above picture. Ich habe auch noch den Copic blender Stift verwendet, der ist aber auf dem obigen Foto nicht drauf. Danke, dass ihr heute vorbeigeschaut habt! 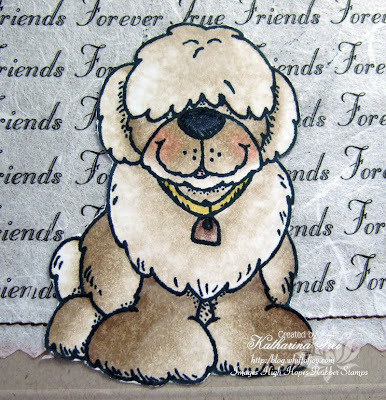 Wow... ok the dog is adorable and your coloring on him wonderful as always, but I LOVE that background paper! Very creative - I may have to try that myself, Thanks for the inspiration.... again! Gorgeous card and inspirational, as always! Fabulous colouring, too. This is so sweet!! That big doggie needs a big hug!! Great card! Such a gorgeous doggie. Just like your card, Katharina. Great job with the colouring. If you look in my blog you can see how I've used WOJ's butterfly from the spring kit to make a couple of backgrounds. Go here. Have a great day, and thanks for being such an inspiration. woww Katharina,what a beautiful card,l love the image. Lovely card, and Odie is sooo cute,sundays are fab to spend time with your family so glad you enjoyed it. Just such an adorable card! Love your cute dog and such great background paper. Gorgeous card! Your cards are just so elegant! I love your coloring with copics!! Great job and such a fun challenge. absolut knuffig! Das Bananenpapier zeigt einen tollen Effekt. 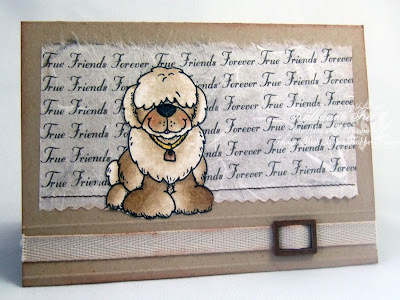 Great fun card-perfect for any dog lover! Aawwe.. such a sweet doggy. Love you`re coloring and the colors! 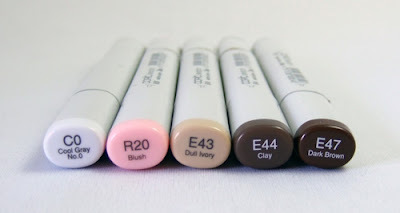 I just got my first copics and studying every detail I can find when it comes to coloring with copics.. LOL! Love the belt across the card too. das Motiv ist ja süß, eine wunderschöne Karte. wieder eine wunderschoene karte von dir, toll coloriert wie immer. das motiv ist total suess. in rom war es auch schoenes wetter, es wird langsam fruehling. Wunderschoen, wie alle Deine Werke! Ich habe auf meinem Blog etwas fuer Dich und hoffe, Du aktzeptierst! das ist ja auch wieder eine süße Karte!